Seattle is the salmon capital of the continental United States (Alaska does a pretty good job of it as well) but even knowing Seattle’s salmon reputation, I wasn’t prepared to find salmon sold at the Seattle Mariners’ ballpark, Safeco Field. 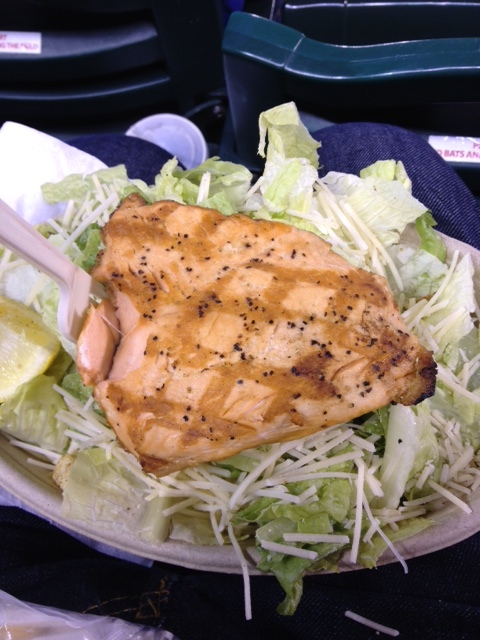 Salmon salad was a great surprise at Safeco Field in Seattle. Bring your own oil and vinegar packets so you can spike the high-fat dressing. My love of salmon made Seattle a logical vacation spot for my wife and I. Seattle is awash in salmon. Indeed we had it everywhere from Pike’s Place Market to Safeco Field. How many baseball stadiums have a salmon offering on their menus? But when we ate out with a good friend of ours who lives in Seattle, she took us to a wonderful place we wouldn’t have found on our own, Ray’s Boathouse. 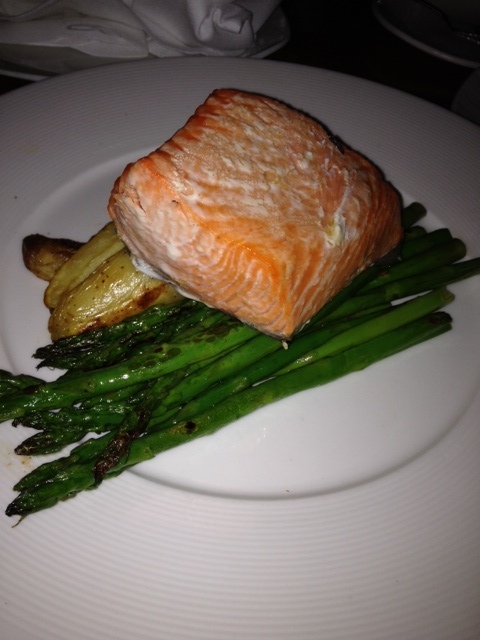 My salmon at Ray’s Boathouse in Seattle…wonderful. Ray’s served me the best salmon I had during my time in Seattle. I asked for it and the asparagus and potatoes that accompanied it with no salt, as I usually do. The special request was not a problem for Ray’s The salmon was the thickest I had in Seattle, and so wonderfully flavorful. 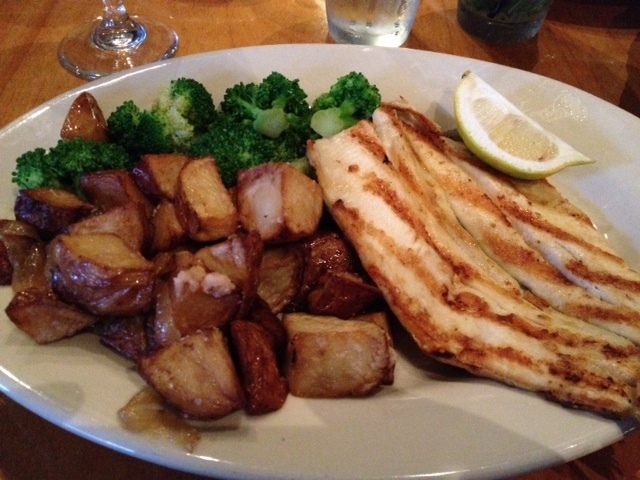 My wife ordered her favorite, halibut, and called it the best halibut she’d ever had, high praise indeed from such a halibut fan. The atmosphere was upscale casual and the place is mammoth, so we had no trouble being seated fairly quickly after we arrived. Ray’s is a special place to visit should you be in Seattle, enjoy. I wrote early this year about a great panko breadcrumb find at Costco. Indeed, the giant box lasted me from February through August. 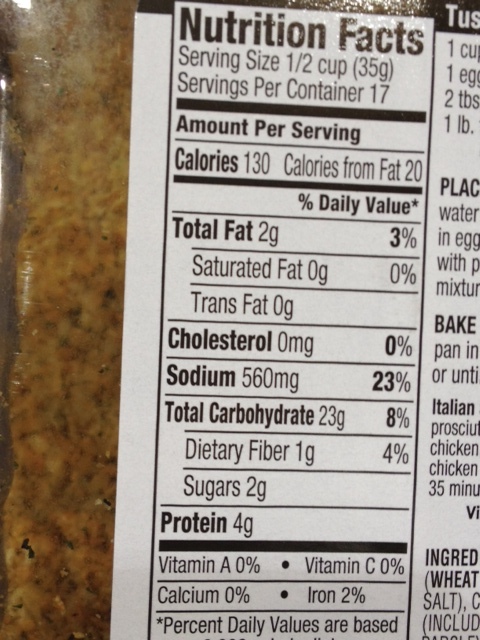 But I was very disappointed when I went back to Costco recently only to find it had switched to a different brand of panko breadcrumbs — one that’s incredibly high in salt. Shame on you Costco! 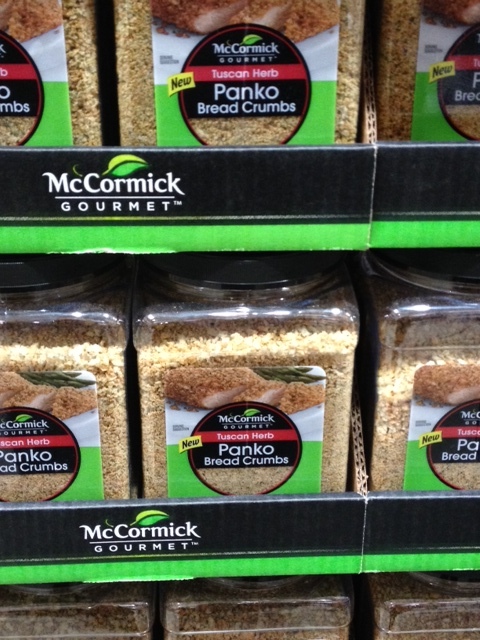 Costco has dropped a low-sodium brand of panko and now carries this from McCormick, an offering loaded with salt. Shame on you Costco. Despite recent headlines like “Butter is Back” and “Eat Butter” and “Don’t Blame Fat,” dietary guidelines still tell us to limit our saturated fat intake to less than 10% of our calories and even 7% to further reduce the risk of heart disease. Total fat intake recommendations remain between 20-35% of the total diet. I met Ginger Hultin MS, RD, LDN, is a Chicago-based freelance writer and dietitian, whle on a recent TV show to discuss diet, fat and health and was impressed by what she had to say. The very low fat diet by Dr. Dean Ornish at about 10% total fat continues to be awarded “Best Heart Healthy Diet” each year and success stories like John Frank’s inspire people to eat healthy and stick to a diet relatively low in fat for optimal health. All diets consist of three major food types, or macronutrients: carbohydrates, protein and fat. Even a very low-fat diet will have some percentage of fat included, so which are the best choices? Eating healthy on a budget, while having health issues-ie: diabetes, heart disease, organ transplant, etc, can be difficult but attainable. A few hints and tips I’ve followed throughout my “Simple Healthy Fresh” cookbook series are, in fact, simple. Eggplant is one. Now, don’t wrinkle that nose, eggplant is what I call a neutral vegetable, meaning it can take on any flavor and be in any dish you can think of. Soups and salads are your friend. These can be made out of anything-especially those ‘free foods’ I mentioned earlier (including eggplant) like celery, onion, all cabbages, greens, cucumber, mushroom, radish, zucchini. With small additions of other items you can have ratatouille, gazpacho, spring/fall/winter/summer soups. 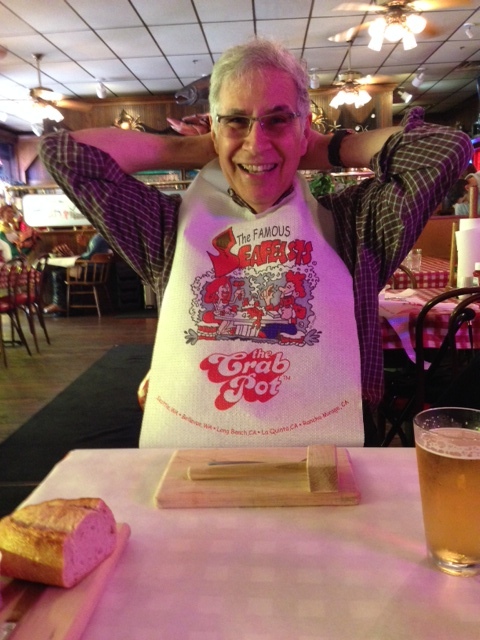 This blog began after I had angioplasty done to open a severely blocked artery to my heart. I recent passed the two-year mark since that surgery, passing a physical with flying colors. You are not what you eat: Is fat as bad as we thought? from Eva Voinigescu on Vimeo.